A step back to Korea for a moment of sad and disgusting news. Private First Class Yoon, collapsed, choking on a piece of food during a beating. He was pronounced dead at a hospital the next day. The fabled DMZ. It is a trip worth taking once with the Adventure Korea tour. If anything, to be in an important area of history. The Asian version of the Berlin Wall. You also get to see one of the tunnels that the North Korean’s dug with the goal of having approximately 30,000 soldiers in Seoul within an hour(every hour actually). There are a total of 4 known tunnels and a suspicion of more. The funny thing is that they are way over-secure with the tunnel. You are not allowed to take any pictures. Why? It’s not like the North Korean’s don’t know about it!! Both sides agreed to make cement walls to block each side. 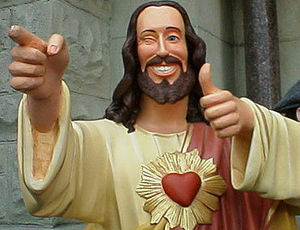 They did, conveniently, leave a small hole that you could look through (at an opposing camera I was told, so I posed with a ‘Buddy Christ‘ thumbs up for the North Koreans.). There was also a tiny metal ‘service door’ that a person could get through but hardly a 10,000-strong threat now. Maybe they were concerned that the Kim Jong Ill regime would find out about the not-so-sturdy pad-lock that was keeping the door locked? Ooops….did I type that out loud? The first pictures you will notice will be that of an amusement park. That’s right. An amusement part as part of your DMZ tour, it’s in Imjingak. Once you get over the whole capitalistic nation of such a thing being part of a DMZ tour, the rest gets more interesting. There was a large bell built here. 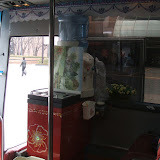 The Liberty Bell was built at the starting New Millennium 2000 for wishing a peace and unification between two Koreas. Now, with any war you will have relics. This one is surely one of the ‘best’ ones I have ever seen (or care to see, truth be told). 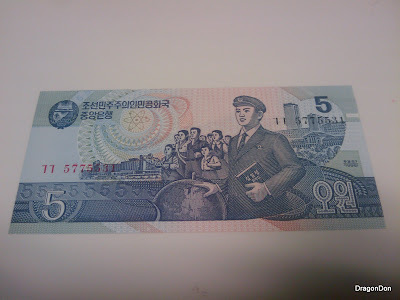 I also was able to buy North Korean money while here. 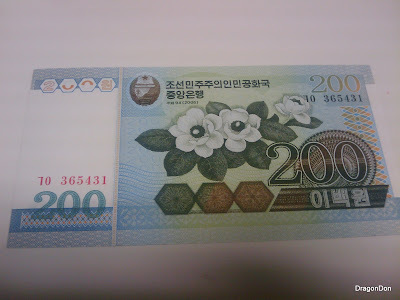 More pictures of different currency in Web Album, click here. After here we went to the 3rd Tunnel of Aggression. Due to ‘security concerns’ there are no photos. I suppose I could have taken some from outside but who really cares what the pretty building looks like? Since we had to pack all our electronics before going down into the tunnel, I can only show you this picture from the Wikipedia article. And yes, I had to give up my weekend hat for a goofy yellow one. 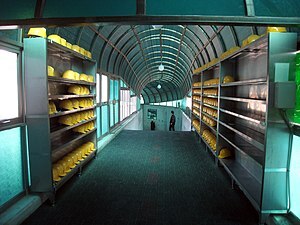 The tunnel is stupidly short in height, but then again, Koreans are short so they wouldn’t have to duck. It is 1.7 km (1.1 miles) long, 2 m (6.6 ft) high and 2 m (6.6 ft) wide. It runs through bedrock at a depth of about 73 m (240 ft) below ground. In order to get to that 73m depth, we had to walk on a 400m slope down that was enough of a workout from not just running down and/or rolling down the walkway. Finally our trip finished with a tour of the last train station north from South Korea. These are just the highlight pictures. You’ll want to see the whole album. Click on image for whole album.